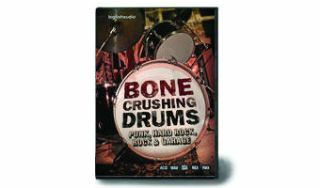 Bone Crushing Drums is the latest loops DVD release from Big Fish Audio. As you'll no doubt guess from the name, this collection gravitates towards rock's heavy side featuring punk, garage, hard rock and straight rock samples. Each genre contains 10 to 16 song sets giving you 50 total sets of 24-bit stereo loops. Each loop is available in multiple variations including fills, endings, intros, and a room and dry version. Bone Crushing Audio costs $99.95. For more information visit Big Fish Audio.